The ability to apply custom styling to individual menu items is one of the most powerful features of Max Mega Menu Pro. If you wish to apply styling to an individual item (for example, to highlight an item in the menu), go to Appearance > Menus. 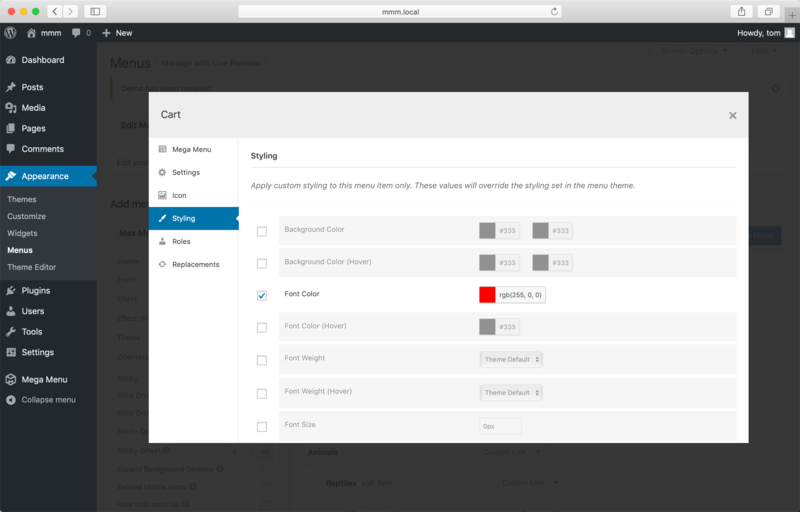 Hover over the menu item you’d like to apply styling to and click the blue ‘Mega Menu’ button. Styling options can be found on the “Styling” tab. Settings can be individually enabled in order to override the default menu theme styling for the menu item. Using the Styling tab will ensure the correct CSS is automatically generated for the menu item – we don’t use shortcuts like !important or inline styles.